We're Hiring - Landscape Designer + Summer Intern! Are you looking for an INTREEGUING place to work? Intreegue Design is seeking a talented, creative, landscape designer with 1-3 years experience to join our team. This position has the opportunity to work on projects ranging from commercial, institutional, high-end residential, and planting design. Our projects span the globe across three different continents. Apply Now! We promote a passion for our profession in a collaborative team environment. Submit Resume/Portfolio in pdf format. Intreegue Design is seeking a talented, creative, 3rd/4th/grad student to assist in day to day tasks and high design projects ranging from commercial, institutional, high-end residential, and planting design. Submit your resume now! Application package must be received by April 17th. Please include Resume and Work Samples in pdf format. LEARN MORE AND APPLY ON OUR INTREEGUE CAREERS PAGE! We're Hiring - Landscape Designer + Fall Intern! 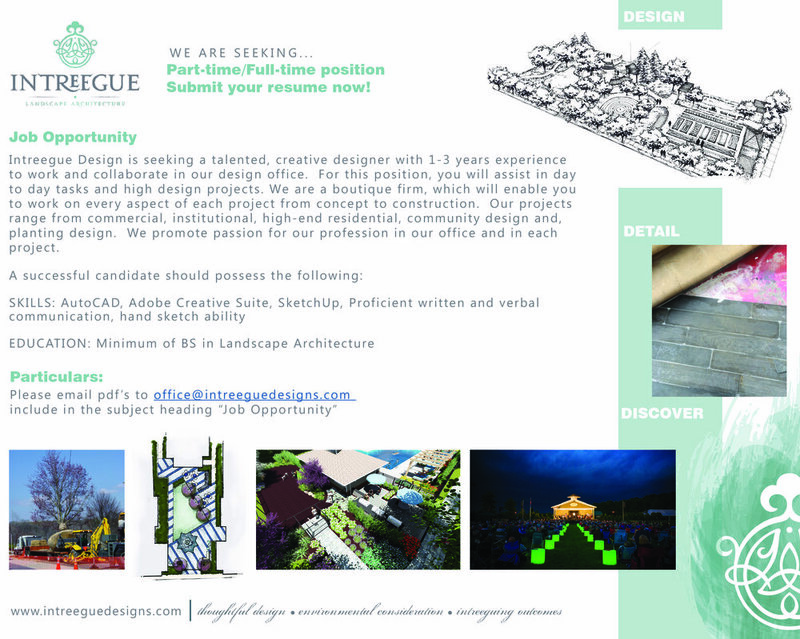 Intreegue Design is seeking a talented, creative, landscape designer with 2-5 years experience to join our team. This position has the opportunity to work on projects ranging from commercial, institutional, high-end residential, and planting design. Our projects span the globe across three different continents. Apply Now! We promote a passion for our profession in a collaborative team environment. Submit Resume/Portfolio in pdf format. Intreegue Design is seeking a talented, creative, 3rd/4th/grad student to assist in day to day tasks and high design projects ranging from commercial, institutional, high-end residential, and planting design. Submit your resume now! Application package must be received by August 31st. Please include Resume and Work Samples in pdf format.